Now that I finally have a natural everyday makeup collection that I'm happy with, I thought I would share which products I'm currently reaching for on a daily basis. It did take a lot of trial and error to find products that actually worked for me and impressed me enough to successfully replace my "conventional" makeup staples, but I'm finally there! Hopefully this will give you a few ideas if you're attempting to go "greener" with your makeup products! For concealer, lately I've been using the RMS Beauty "Un" Cover-Up in shade #11 (full review here). Initially I was using this to conceal around my eyes as well as blemishes, but I only use it for blemishes now as I figured out it was causing an annoying (and attractive!) little eczema flare up above my eye. Don't let that put you off though, it's still a great product and a lot of other people with sensitive skin have no issues at all with it! I'm using up a couple of samples of Vapour Illusionist Concealer for around my eyes instead at the moment. Blush (or blusher as we tend to call it here in the UK!) wasn't really something I used to use before, but it really does make a big difference and I love using UNE's Breezy Cheeks Blush in the shade B03. It has a cream-to-powder consistency and gives a really natural looking flush of colour. UNE products are made by Bourjois so I would definitely suggest checking them out if you're a fan of Bourjois' conventional product range. I always finish off with the eyes as I just feel bizarre without some kind of eye makeup! For my basic everyday look I tend to use Beauty Without Cruelty Soft Kohl Pencil in Charcoal - a dark grey colour which is less dramatic than black, but still gives plenty of definition. My usual mascara of choice is Green People's Volumising Mascara. This mascara is great for a more natural/subtle look and lasts really well throughout the day. 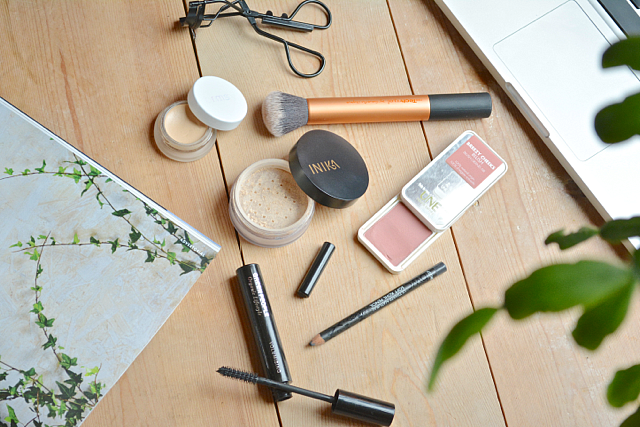 So there you have a little insight into my basic everyday makeup! I like to keep it simple day to day but do add in a few extra products sometimes! If you like this post I'll be sharing my go-to makeup for a more dramatic look/special occasions another time - let me know if that's something you'd like to see? Do you use any of these products? I have the RMS Beauty "Un" Cover-Up and recently got a sample of W3LL People concealer and i must say the latter impressed me more! However un cover-up does really work great on the undereyes!